So after i started Starting Strength in July 2013, i have been reading up on whatever i could find on the 5x5 approach/method/system. Here are some basic elements of it. This is a primer, therefore only covering the most basic elements that make up the method. For more detailed information, do a search on some of the terms that i would italicize in the text below. No links provided as there are a ton of information on them. Disclaimer: I am not the inventor of the system. This is an old system commonly attributed to Bill Starr and contemporaries or even earlier. There are many iterations and versions and therefore some of the info here may vary from other sites. The info here is my understanding on the common elements of the system. Currently i am at Advanced Novice so my understanding of Intermediate and above is only from reading. 5x5 in it's most basic definition means 5 sets of 5 reps. The 5 sets could be all the same weight (sets across, eg Stronglifts) or increasing weights (ramping, eg Bill Starr, Glenn Pendlay and Madcow) or any combination of them. The number of reps in each set could be 5 or could be anywhere between 1 to 5. The number of sets does not have to be exactly 5. Some sets could be repeated. If you are doing 5x5 across, you do a few warm up sets before the work sets. 5 reps is a good middle ground between pure strength and hypertrophy, giving you a good balance of both. Depends on the volume needed at the target weight / top set / working set. Beginner / novice is defined as being able to add weight to the bar every session. Search for "novice effect" in Practical Programming for Strength Training. Intermediate is defined as being able to set a new PR every week. Advanced is defined as being able to set a new PR every month or months or years. These protocols are based on 3 times a week. The three days are named Monday, Wednesday and Friday. But it could be any three non consecutive days followed by two days off. Three is a good number that most people can commit to. Two is too little frequency. Four may not be good as it would be easier to miss sessions and screw up the whole system. Session-to-session increase aka add weight to the bar every session. Note: Deadlift or other Pull can be placed on any day as you already have fatigue from the first two exercises and you can place it any where that would give you the most recovery. 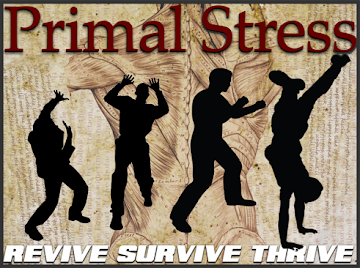 Search Starting Strength forums for more details. Deadlift is always done for 1x5 as it is very taxing and more sets would make recovery suffer. 1x/week of Deadlift or less is sufficient to drive progress. Squat would improve Deadlift so as long as you are squatting 3x a week, it is not a big issue to have less Deadlift frequency. Pulls could be Power Clean, Pull Up or Bent Over Row. You could do other pulls but the most recommended are these. I don't differentiate between Bent Over Row and Pendlay Row. As far as i am concerned, the Pendlay Row version where you set the bar down every rep is more reasonable to save your lower back. Light day midweek, otherwise session-to-session increase. Top set of Squat on Wednesday is 80% of Monday. Otherwise everything else is the same. If you are doing Front Squat on Wednesday, use the same ramping sets as Monday, but it would all be lighter due to the nature of the exercise. Same goes for Press as compared to Bench. Next Monday you would repeat Friday's top set but for a set of 5. It seems to me that Intensity is enough with any of these protocols. Volume is not so much a factor in creating adaptation. I have only done 3x5 across and 5x5 ramping so i can't really comment on 5x5 across. But for practical purposes, to keep sessions in 1 hour or less, i would say 5x5 ramping is a more reasonable choice for people who don't live in the gym. For 3x5 across, as the weight gets heavy, sessions would get very long (up to 1.5 to 2 hours) because of the rest between sets. At this stage of Novice to Advanced Novice, you are not strong enough to do a lot of damage to yourself every session, ie you can recover fast enough to add more weight to the bar at the next session, ie fatigue is not an issue. You train, recover, train harder, recover and so on. 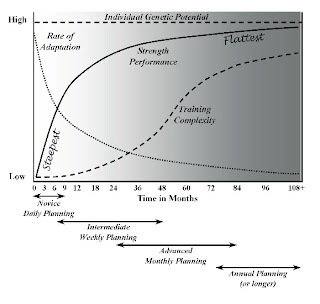 Here the adaptation model is the Single Factor Model which only considers Fitness. 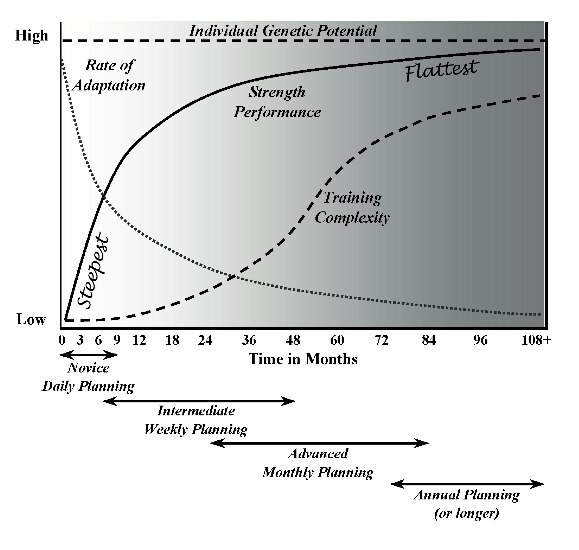 As you get closer to your genetic potential, you need more workload (Volume) to drive adaptation. Simple variation in Intensity (like in Novice to Advanced Novice) does not provide enough Volume to drive adaptation. 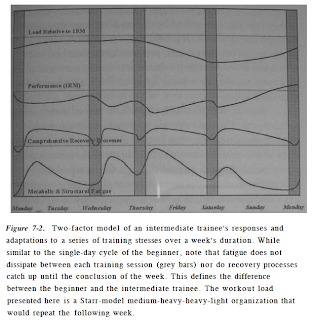 More Volume means more Fatigue, which needs more time to recover. But you can't do the next session when full recovery occurs as that would be too little frequency and therefore Fitness does not improve as much. So we need to vary the Volume as well as the Intensity. We now have Fatigue and Fitness to consider, aka Dual Factor Model. Or in short Volume-Recovery-Intensity, which parallels Heavy-Light-Medium. Welcome to the Texas Method (Glenn Pendlay). Note: There are various interpretations on the placement of Deadlift and other Pulls depending on your recovery. Search Starting Strength forums for more info. For most non-professional strength athletes, we don't need to look beyond Intermediate programming. 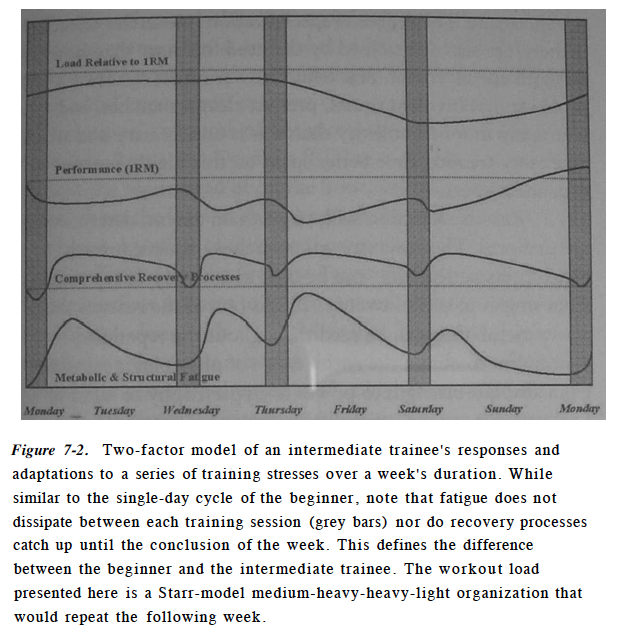 Which is properly termed Periodization. Note: Intensity could also be called Intensification / Peaking.